What do you get when you put 30 enthusiastic, gorgeous and passionate girls together with a challenge and a blog? A lot of raving, ranting, chitter, chatter, venting and in some cases hyperventilating! The challenge, which was picked by Brilynn, was not the easiest. A chocolate crepe cake as created by Martha Stewart. It has always been Brilynn's dream to make this cake and so she decided to get the entire Daring Bakers team to share the dream. The Daring Bakers blog (a private blog only for the privileged LOL!) was alive with lively chatter. Tom's birthday was earlier this month so I had the perfect occasion to experiment with the cake. I think I was one of the first to give the challenge a try. I was a bit intimidated by the challenge. It was my first after all and I really did not want to let any of my team mates down. The challenge as set by Bri, was to make the crepes and the glazing but the filling and the toppings could be changed as desired. Well at first I thought to use Nutella for my filling, but my thoughts did not let me rest. It must have been a sign from the Cake God - the doorbell rang and the mailman brought my copy of Chocolate Desserts by Pierre Hermé written by Dorie Greenspan. As I opened it, the first recipe that I saw was for a wonderful, rich chocolate pastry cream. It took me a millisecond to decide. This was my crepe cake filling. However, it did not rest there. I just could not help myself and I had to tweak with the Holy Meister of Desserts' recipe too. I dared to make a slight change to this - I am a Daring Baker after all! The recipe below is the one of my tweaks and changes. In some cases I was forced to make a few minor changes to avoid catastrophe! In a small saucepan bring approx. 60 ml water to a rolling boil over medium-high heat. Add butter, 1 piece at a time, whisking to combine after each addition. Remove from heat; stir in chocolate until completely melted. Set aside. Mix together the flour, sugar, and salt in a medium bowl. Whisk the milk, vanilla and eggs together in another medium bowl. Using an electric whisk/blender, gradually add milk mixture to flour mixture, whisking until smooth. Finally add chocolate-butter mixture and whisk until it has incorporated - do not overmix. Pour through a fine sieve into a pitcher or a container with a pouring spout (I used my lemonade glass pitcher) and rap the pitcher on the counter to burst any air bubbles. Cover and refrigerate for at least 2 hours or overnight. When you are ready to make the crepes, whisk the batter gently just to re-blend the ingredients. The batter should have a consistency of heavy cream. If it is too thick add some more milk, just a tiny drizzle at a time. Lightly coat a crepe pan or nonstick pan with melted butter. I used a small 19 cm non-stick pan for this. Place the pan on a medium heat until just starting to smoke. As soon as the pan is hot, lift from heat and pour about 3-4 tablespoons batter into pan, swirling to cover bottom. Reduce the heat to medium-low and return pan to heat. Cook for approx. 30 seconds. Run a icing spatula around the edges of the crepe and check the underside - it should be golden. If you are happy with the coloring flip it over - yes, I used my fingers - and cook the other side till golden. This side will cook faster than the first one so make sure it does not get too dark. So, I needed a new plan of action and decided to make them a bit thicker. This worked really well and I had no trouble flipping the crepes. Slide the crepes onto a plate, stacking them on top of each other in stacks of 5 or 6 and separating each one with a sheet of baking paper to avoid them sticking to each other. Repeat the process with the remaining batter, coating pan with butter as needed. You should yield about 25 crepes. When packed airtight you can refrigerate them for a day or frozen for a month. Fill a metal bowl with ice cubes and cold water. Set aside a smaller bowl that fits into the ice bath and will eventually hold the pastry cream. Set aside a fine meshed strainer too. Bring the milk to a boil in a small saucepan. In a heavy-bottomed medium sized saucepan whisk the yolks, sugar and cornstarch together. Whisking all the time, slowly drizzle a quarter of the hot milk into the yolks. Still whisking, pour the rest of the milk in a steady stream into the tempered yolks. Strain the mixture into the saucepan. Place the pan over a medium heat and continuously whisking, bring the mixture to a boil. Keep the mixture at the boil - whisking vigorously - for 1-2 minutes. Still over the heat, stir in the chocolate, then remove pan form heat. Scrape pastry cream into the small bowl set aside. Place the bowl in the ice-water bath. Stirring frequently, to keep the mixture smooth, cool the pastry cream to 60 degrees Celsius. Remove the cream from the ice-water bath and stir in the butter in 3 or 4 additions. Return the cream to the ice-water bath, set aside, stirring occasionally until it has completely cooled. Cover tightly in plastic wrap, pressing the plastic against the cream's surface to create an airtight seal, the cream can be refrigerated for 2 days. Bring the cream to a boil in a medium saucepan over a medium heat. Remove from heat and add the chocolate. Swirling the pan around allow the chocolate to melt. Add the butter and allow to melt mixing occasionally. Let stand for 5 minutes. Stir until smooth. For once I followed instructions of a recipe!! eHow is a fantastic website that shows you how to do 1001 things. This includes making candied orange peel. Place a crepe on a wire rack or a large wooden board. Using a spatula spread about 2-3 tablespoons of pastry cream on the crepe. Cover with another crepe. Spread another 2-3 tablespoons of pastry cream, then cover with a crepe. Repeat this process until the pastry cream and crepes have been used up. In my case I ran out of cream on about the 18th crepe. Spoon the glaze on top of the crepe cake and spread across so that it is evened and smooth. Allow the glaze to run down the sides of the cake, smoothing and evening with the spatula. Decorate with the orange peel and if desired some hazelnut brittle. Allow the cake to set then move to a serving platter an refrigerate for a few hours. When covered loosely in plastic wrap the cake can be stored in the refrigerator for up to 3 days. If you would like to try out the original recipe from Martha Stewart you will find it here. A helpful visual step by step of the cake can be found here. Whichever version you do try - I wish you all the very best of luck. Make sure you cut out a big piece for yourself - after all that effort you deserve it. I was expecting the crepes to be a bit rubbery as I made them slightly thicker. But they were not they were smooth and fluffy. I made this cake for Tom's birthday and although it was not enjoyed on the very same day, we dug into big pieces the next day for dessert. 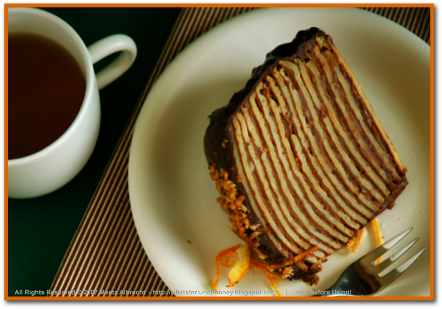 It is a very filling cake but the delicate flavor of orange really zests this cake up adding a slight zing to the cake. All that chocolate makes it a chocolate lover's dream come true. I preferred the idea of the light pastry cream to the filling hazelnut cream of the original recipe. It was just perfect for this type of cake. To see the other Daring Bakers' experiments simply click here and work your way down the list. Looks beautiful Meeta chocolate and orange are one of my favourite combinations! Meeta, yours looks stunning (as I suspected) and I love the idea of the orange cream! I must get ahold of that dessert book. A gal can never have too many chocolate and dessert books, right? Eine Million Kilokalorien pro Happen, sieht aber gut aus. Ich käme nie von alleine auf die Idee, eine Pfannkuchentorte zu machen. Erst seit Eine Geburtstagstorte für die Katze habe ich die Marmeladenversion für Henning gemacht. Oh! I've been waiting ever so impatiently for you to post your recipe! Meeta, it's stunning. Really. Give yourself a huge pat on the back and congratulations on your first Daring Bakers challenge!!! I really like the filling that you made and you know, if I tried this cake again, I would definitely go for a pastry cream type filling. It is a wow of a cake! Orange would be a wonderful flavor with the chocolate! Welcome to the club. Wow! How amazing and such beautiful pictures! It is hard to tell that we made the same cake! Oh, Meeta! Fabulous result. And the orange cream..wow!I bought this book ( the PH one) and boy it is a great book. Stunning, Meeta! 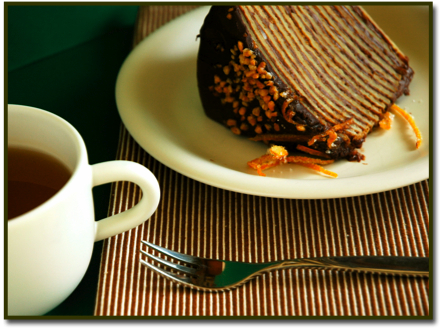 I love, love, LOVE the sound of that delicious orange chocolate pastry cream - simply luscious! I knew your cake would be beautiful to behold - and your gorgeous pictures and beautiful writing make it that much more special. Wonderful job! Meeta-it's gorgeous and I love the orange chocolate angle on the cake! I can understand that you thought it was better than youknowwhat!! Good job! The orange is a nice touch. Oh my, it is so beautiful! I like that you inverted the dark and light parts (ie choc, filling with light-colored crepes), we are the rebels. I'm sure it was delicious also. Meeta I think the cake turned out gorgeous and perfect for a birthday celebration! Great realization of the recipe ,meeta ! wow. meeta, that is just stunning. You can't go wrong with Pierre Herme on your side. Beautiful cake! I like your tweakings! It is very rare that I stick to a recipe but this once did not because I loved the combos of flavors. Can't go wrong with Pierre Herme, whatever he touches turns to gold! Chocolate and Orange is a wonderful combination. The orange 'lightens' the chocolate, doesn't it? Any tips on slicing such a cake? What kind of knife did you use? another million layer cake ;) looks beautiful you and freya & paul have really outdone yourselves. brilliant. Meeta, you have the ability to make anything look good, even this disaster cake! Fantastic! Late but definitely worth it. Love the use of the orange. Fun to read everyone's posts about this. Your cake looks delicious, but oh, so much work! I wouldn't be able to pull it off -- but I'd be happy to sample any leftovers! 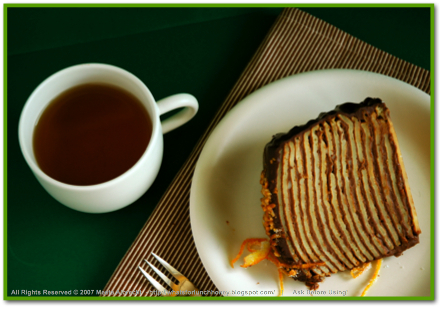 I LOVE the stripes on the place mat with your cake on top. Very creative! Gorgeous photos of a beautiful cake. The chocolate orange combination is such a good one and the pastry cream...yaaa more chocolate!...is a good idea, although I had fun making the other filling once I got rid of the 'hazelnut creme' stuff. Beautiful job & worth the slight wait. Absolutely love the choice of green background too. Congrats Meeta, the cake looks great and the slice, heavenly. Layered stuff always looks nice when sliced eh? Oh my! Thanks everyone for such outstanding feedback! For my Daring Bakers gals - WE DID IT!! Now that we have mastered this we can master anything hehehe! Laura, thank you and yes that chocorange combo was really outstanding! Freya - Go get that book girl it's outstanding and Pierre just has a lovely way with words! ANON - would love to translate the ingredient list for you. Send me an email of the items you are not familiar with and I'll be happy to let you know what products I used. Ulrike - Ja - nicht nur eine million sondern eine milliarde! ich habe auch nur ein einzige stück gegessen!! Ivonne - I thank you so much for convincing me to join the group. If it was not for you I guess I just would not have dared. Thanks for getting me here. HUGS!! Tanna - thanks! I feel really great with you gals! Quellia - yes we did! Your raspberry version is pretty awesome! Unfortunately unless you make this cake for me - I will never really know how awesome - I am not gonna be making this in the next 10 years or so LOL!! Valentine - yes, I was so captivated by Pierre's wonderful recipes not to mention all the gorgeous photos! Gilly - Thanks so much. Your words really touched me - *sniff* I loved your version too. You have such a gentle and calm way that it is always a sweet haven when I visit your blog - honestly. I loved your creativity with the decoration on the cake! Ilva - one of the things I enjoyed the most about this challenge was simply chatting with you over the weekend and swearing at this cake. That was fun! HEHE! Mary, thanks. We had it the next day as we were in a rush to get to dinner, but it was still good! Sandeepa - and a lot of calories!! Mary - yup I had that feeling the whole time I was making the cream. Not like Martha!! LOL! Pat - thanks sweetie. It was great getting to know you too in the process of theis cake!! Helene - PH is a god I agree and I will be making a few things from the book. Looking forward to your challenge this month! TC - the orange combo did add a special note to the cake. I have a wonderful large pastry knife that I bought about 8 years ago. Costed me a bomb but it was worth every cent. I used that to cut through the cake and it was like a hot knife through butter - almost literally!! Bril - don't be so tough on yourself. This was such a great challenge you picked. I had the opportunity to try out so many new things. Thank you! Lydia - the next time I make this cake I'd be happy to give you a piece - but you'll have to wait for a long time. I am not going to be making it again anytime soon LOL! Kristen - as I started to take the pics I remembered the striped mat and it was just a perfect match. Thank you for your comment. Elle - thank you. Your cake was wonderful too. I wish it was possible to send pieces of each others cake around. Seeing is a treat but tasting would be even better. Priya, Paz & Cynthia - thanks you three. That looks amazing! 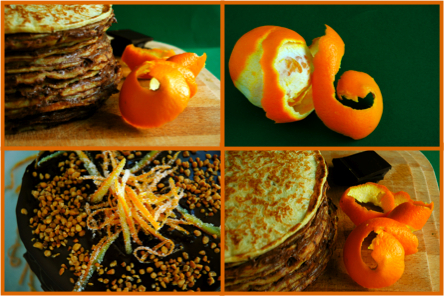 Your substituting the original filling with the pastry cream, and adding the orange peel were inspired moves! 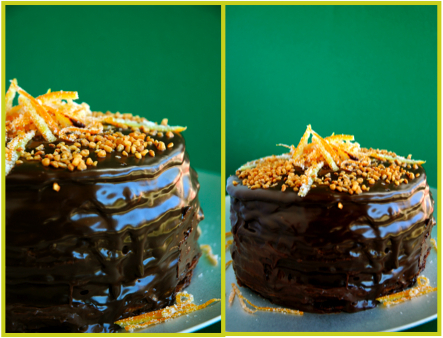 Wow Meeta, that cake is just stunning... Chocolate and Orange OMG, what a combination! Look at that crepe cake..looks wonderful..and so rich..
What a cake! "Chapeau" again! So well done! Delicious had this cake on the cover of one of their magazines. It's one of those "baking project" cakes that I'm still working up the nerve to try. Wonderful pictures and helpful site. I have a question regarding your version of chocolate crepe cake. The layers, the filling and the frosting have chocolate, so what are the white fillings? 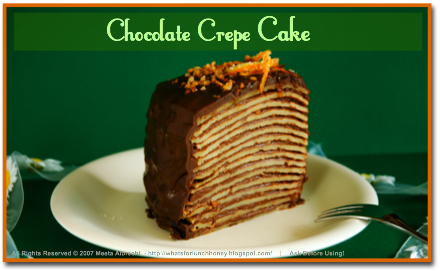 I have a question about your cersion of chocolate crepe cake: the layers, the filling,and the ganache have chocolate, so what are the white layers or fillings? Must say u have the wonderful recipes on your blog, very tempting, i really lied your chocolate crepe, lot of hard work ,but worth the effort, cant wait to try them, keep posting more, would love to catch on your recipes. Lovely cake and lovely photos!